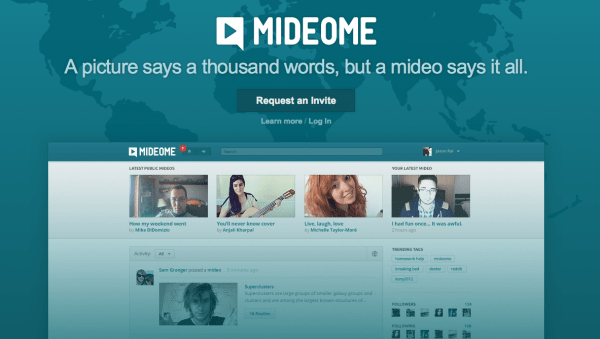 You’ve probably thought of something like this yourself, but Jason Rai and Mike DiDomizio have actually built it, and now you’ll have no option other than to kick yourself for not acting sooner and happily join their network, MideoMe, which combines our great loves for social networking and videos. Imagine a remix of Facebook and YouTube, a video version of the social network – a FaceTube. And then imagine the concept brought to life with a tasteful, minimalist touch that provides an incredibly smooth user experience, and you’ll have a sense of what MideoMe is all about. Then visit the real version! 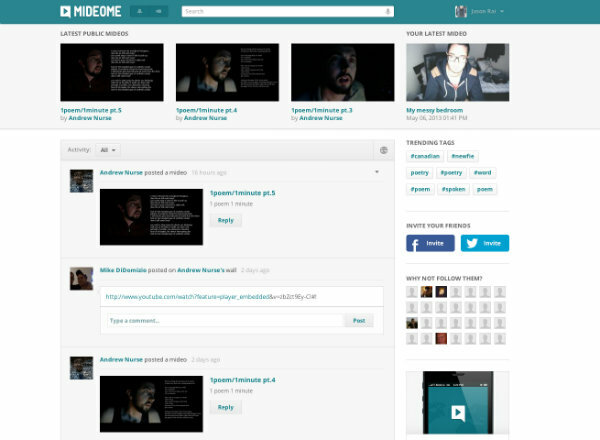 With a membership on MideoMe, you can make your own mideos (videos up to a minute in length), share your mideos or other favorite videos, and enjoy real-time mideo posts from your friends. Share mideos directly on other sites such as Facebook, Twitter, or Tumblr. Broadcast your messages to selected friends or live to the entire world. The heart of the service – maybe the beginning of a movement and a new word entering our daily speech – is the mideo, the self-made videos. These 60-second videos may be recorded or streamed live. They’re intended for both conversation and as a way to share life’s important moments. The site’s design purposefully resembles Facebook to make the interface familiar and easy to navigate. Even with the videos added, the appearance remains remarkably uncluttered. The 60 second mideo posts restrain a format that could easily leave the station like a runaway train; the size is conducive to sharing content likely to be opened / viewed / enjoyed. Everyone wants in on the great video migration, and everyone would like something better from their social networks. MideoMe manages to satisfy these desires with enviably grace. 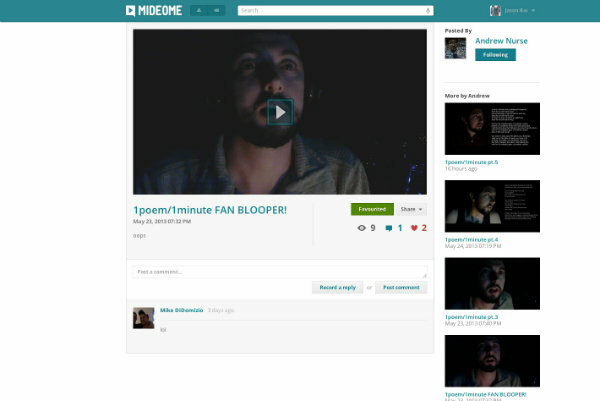 MideoMe wisely forgoes all the fancy video editing tools and keeps the service straightforward. Simple privacy controls, profiles, and mideo creation, keep the site fun. There’s no charge to use MideoMe or join the service. Currently, the startup is in private beta, so visitors may request an invitation to join and help with testing. Users may create as many mideos as they like. Android and iOS mobile versions are in the works. CEO Jason Rai currently lives in London, UK. Co-founder and lead developer, Mike DiDomizio, hails from Ontario, Canada. Both have previous experience working with startups, including another slightly less-ambitious social networking site. Last October, the duo secured £15,000 in seed funding and tutelage from the entrepreneurs behind RakeTheRake to work full-steam ahead on MideoMe. The young startup has boundless promise. Will users take to creating spirals of video discussions around a chosen topic as the founders hope? 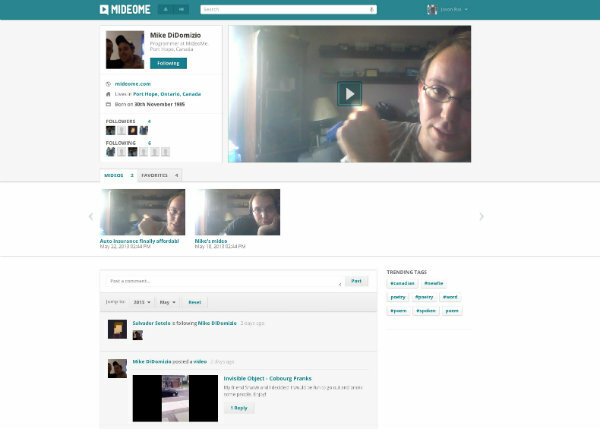 Will MideoMe serve as a convenient repository of favorite videos and preferred means to share? Will creating and posting mideos grow to become the video and social sharing medium of the future? Your predictions in real-time mideos… Go! Mideo has opened sign ups exclusively to KillerStartups’ visitors for a limited time. Click here now to check it out for yourself.